Not Just Tourists is a Canadian non-profit organization that works to bring medical supplies to countries in need. The best part about it? Everything is accomplished by volunteers. The supplies are donated by hospitals, clinics or medical centres. They are then packed into suitcases, backpacks or smaller bags by volunteers. Travellers can sign-up and pick up one of these bad boys and deliver it where it's needed. It's this simple process that can make a huge difference. Contact a Not Just Tourists location near you. Since it's a small Canadian-based organization, there aren't too many out there. The Toronto Chapter seems to be growing quite a bit as word gets out. Their website got revamped so, it's even easier to sign up. 1) You can carry supplies. Are you heading out for your next adventure and have space to bring supplies with you? Do you have some extra time to pack medical supplies, write materials, help with administrative work or speak to groups? Are you a healthcare professional who is in a position to donate medical supplies? We got in touch with Not Just Tourists Toronto and signed up to bring a small pack of medical supplies with us on our backpacking trip to Southeast Asia. Before we left for our trip, we headed over to a pack meeting in Roscesvalles, Toronto to picked up our packages. This is where you'll learn how the process works and what you need to do for a successful drop-off. It can be a challenge to pack medical supplies into an already small backpack, but it forced us pack only essentials. We didn't bother dropping it off in Bangkok or Chiang Mai, since these cities were bigger. Instead, we ventured off to northern Thailand and dropped it off at Pai Hospital, a medium medical centre in the countryside that caters to the villages nearby. They were really grateful and happy to receive our packages. It's a great experience overall knowing that you're travelling to fulfil a purpose - helping out people. Picking up our packages at the pack meeting! About to board our flight. 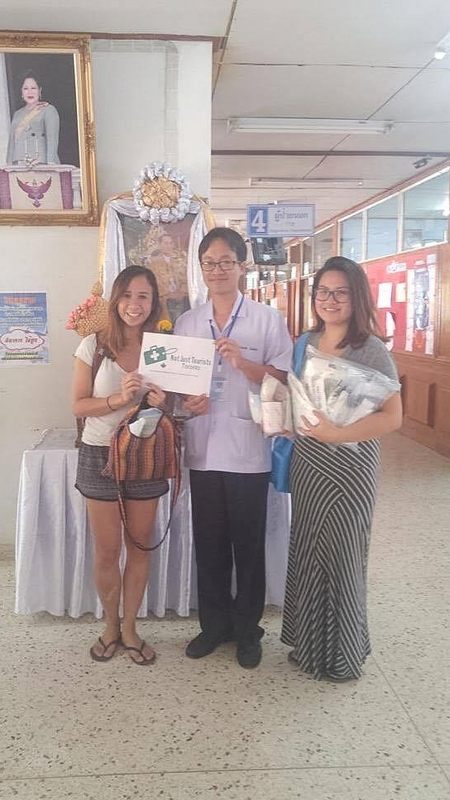 Dropping off the supplies at Pai Hospital. This sums up the organization quite well. Thanks Karen Gord for the poster!